Deepen your relationship with God as you discover your God-given gift of creativity. Creativity is usually defined narrowly and associated only with artists or children. "Creativity is so much more than art making," writes Kincannon. "It is a tool for navigating through everyday experiences to find the sacred in each God-given moment. Those who believe they lack creativity have relegated it to remote regions of their life, burying it under the need for security, approval, and control. However,…creativity does not die; it simply waits to be unearthed and set free." 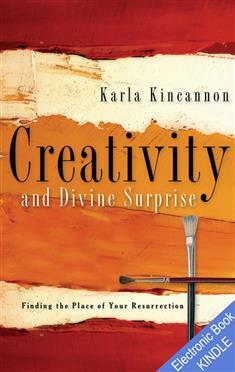 Creativity and Divine Surprise couples insightful meditations with thoughtful exercises that will help you celebrate your divine spark and connect with God. Can't draw a straight line? Color-blind? No worries. If you yearn for God and desire greater awareness of God's presence in your life, you're ready for this book. Through Kincannon's words, you'll see creativity as a source of revelation, joy, healing, and fulfillment, and we all need those things. Ready to dance, draw, paint, take pictures—masterpieces or not? Let the Creator work in you through your creativity, so that you become God's masterpiece.